Famous Fashion Blogger Gia Kashyap tied the knot in a fairy-tale ceremony at Udaipur! Gia Kashyap is one of India’s most famous fashion bloggers and when she decided to tie the knot, we knew it would be an affair to remember! Meet the bride who caused quite a stir by her blog and her social media profiles with her wedding going viral on Insta #GiKaViah! 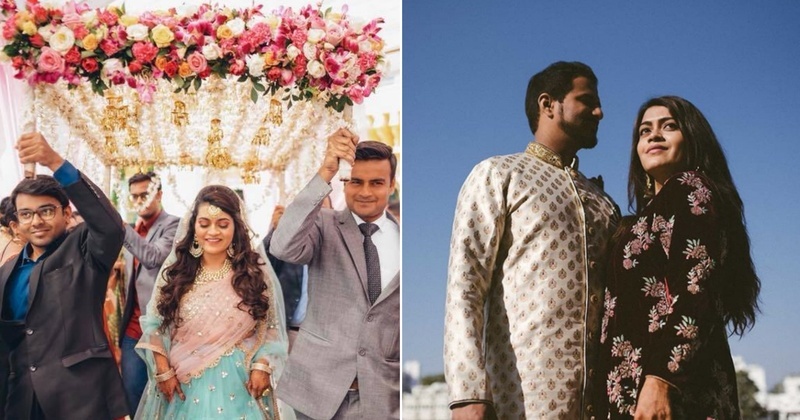 Gia Kashyap tied the knot with Vishal Hazare in a destination wedding at Udaipur and it definitely looked like the wedding of the year. Here’s bringing to you everything that went down at the wedding to give you some major #ShaadiGoals. Rest assured, you won’t stop staring, ladies! Also, the expression on her face was priceless. You can check it out here. For her pre-wedding shoot, Gia chose to wear a velvet anarkali from Flyrobe giving us some major #WinterBrideGoals! For her second pre-wedding look Gia is seen wearing a Aneesha Reddy lehenga, grabbing eyeballs all the way. Her mehendi ceremony was just breathtaking with a lot of colours and inspo! #BrideChilla indeed! Gia opted to keep her wedding look quite subtle. We are loving the natural day makeup in contrast to her pink dupatta - a shade of peach for the eyes and a pop of pink for the lips. For the reception, Gia opted to wear a royal blue lehenga with floral motifs on the lehenga skirt and floral embroidery on the choli. She completed the look with a beaded necklace and earring set and dramatic curls. Sooo, what do you think about her wedding looks?